If you’re looking forward to buying one of the coffee machines from the US producer Keurig, you may be in doubt which one of them to choose. This is commonly a problematic situation for those buyers who aren’t really familiar with different types of coffee machines, especially when they appear to be pretty similar. That’s why we’re solving one of your doubts. In this text, we’re talking about the differences between coffee machines Keurig K50 and Keurig K55 so read on to find out which one of them suits your needs better. Even though both of them have a minimalistic, modern design in black color, when it comes to their weight and size, there are some differences. 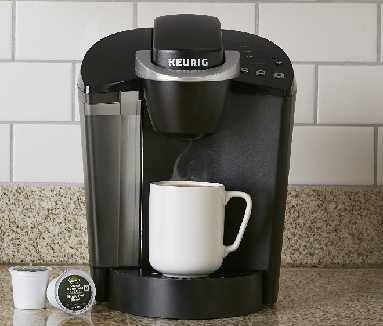 While Keurig K55 weighs 12 pounds and its dimensions are 13 x 13.3 x 9.8 inches, Keurig K50 is a bit lighter, weighing only 7.6 pounds, and has the same dimensions as K55 relative (13 x 13.3 x 9.8 inches). Unfortunately, when compared to Keurig K50, K55 doesn’t bring anything new regarding the brewing capacity and reservoir sizes. Both of them belong to the group of single-serve coffee makers and they are both capable of brewing multiple K-Cup pod sizes, including 6, 8, and 10 oz cups, although the optimal size for the strongest brew is 6 oz for both appliances. They both have the water reservoir capacity of 48 oz and can provide you with more than 6 cups of coffee without refilling the reservoir. Both of them also have the option of removing the water reservoir completely, so that they can be refilled and cleaned easily and in no time. Both Keurig K50 and K55 have a removable drip tray at the base which is also a great feature when it comes to cleaning and changing the size of the container used – it is convenient both for standard and larger cups and travel mugs. Again, those appliances don’t really have different programming options. They both have the auto-off feature and offer you the possibility to be automatically turned off if they aren’t used for two hours – which is pretty helpful when it comes to energy saving. The brewing process is easily tracked by the use of simple button controls and light indicators. On the other hand, they are both offered without programmable clocks. Finally, as you’ve been able to see, except slight differences in weight of Keurig K50 and Keurig K55, there are no significant differences between these two products. Even though the K55 is the newer version of this appliance, it still has the same brewing options as its older relative. The reasons why Keurig brought K55, the updated version of this coffee machine, to the market are the aesthetics of the product and some minor improvements in the mechanics and internal elements that don’t really affect the coffee quality and taste – it’s still the same brewer. I’m very satisfied with my k50 Keurig. The best gift I ever got. In 1 minute I always get a fresh hot cup of Green Mountain Coffee. There are many different Keurig model names that are totally the same in functionality and options. They even look the same.